Please Note - If the system finds a suspect bookkeeping entry, according to the above criteria, it will display a message with the details of the suspicious invoices and will ask the user to approve / cancel the new bookkeeping entry. Choosing "NO" will reopen the "Invoice Header" to update its details. Print Cheque This button opens the "Print Cheque" window, to fill the required details for the cheque. This tab is used for feeding in the payments for the suppliers of the organization. The two fields at the top of the tab ("Description" and "BK Entry Date") will be filled autocratically by the system, according to the "Invoice Header" tab. These field are available for editing. Fill in the fields of the table, according to the required payment. Additional row can be added by pressing Ctrl+Enter or by using the right button of the mouse and choosing "Add New Row" from the displayed menu. Each row will create a new bookkeeping entry. Add Sequential Cheque Autocratically add an additional and sequential cheque record to the table. The "Transferred Amount" and the "Cash Flow Date" fields will be autocratically filled and can be manually modified by the user. 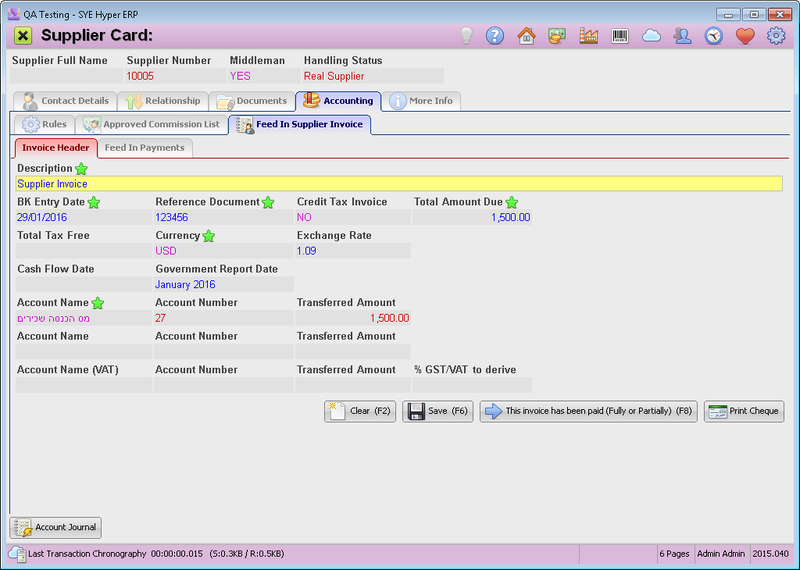 After updating the payments table, Press the Save (F6) button, in order to create the bookkeeping entry. This button is available only after filling all of the mandatory fields. 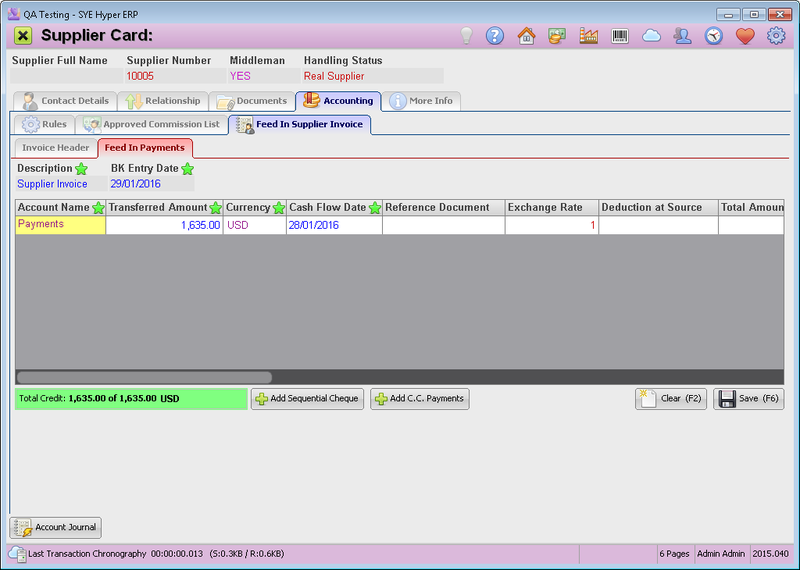 The system will display a message with the bookkeeping entry number. The system will autocratically bundle the the bookkeeping entries if the "Total Credit" is equal to the "Total Amount" value.